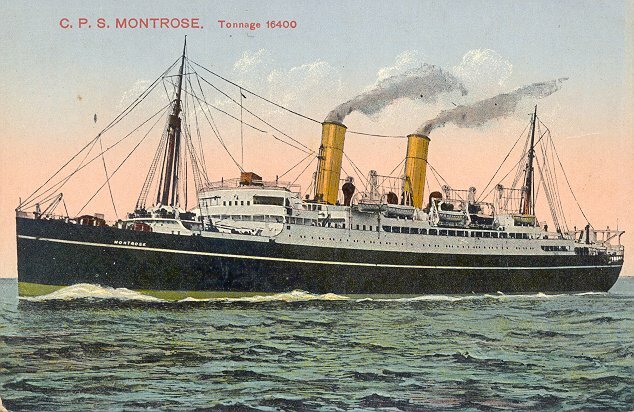 Sister of Montcalm and Montclare, this ship was laid down in 1919 as Montmorency, but was renamed while on the stocks; when she was launched at Fairfield Shipbuilding and Engineering of Glasgow in 1920, it was as Montrose. 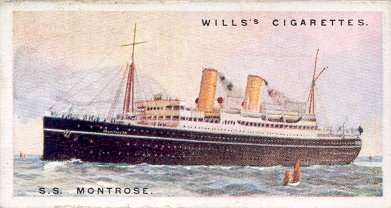 She entered service with a 5 May 1922 roundtrip from Liverpool to Montréal and back, a route on which should would remain until 1928. In 1928, her European base was moved eastward, to Antwerp, and in 1929, to Hamburg. In 1931, Montrose underwent a major overhaul, including the installation of new single reduction turbine engines, at Harland & Wolff, Belfast. 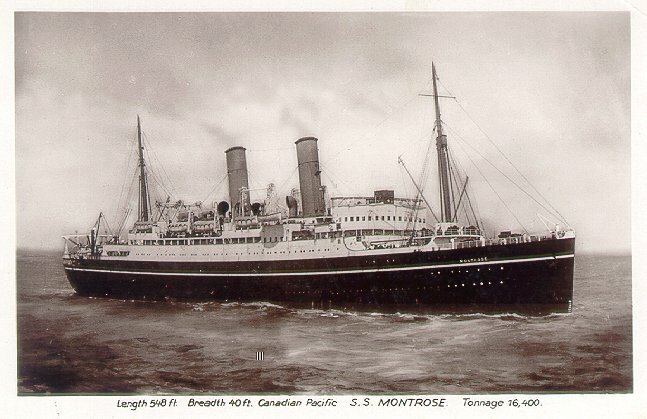 She then returned to the Hamburg-Montréal service, but by 1932 her principal occupation was cruising. 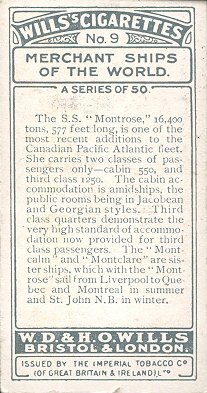 Her last transatlantic trip was from Liverpool to Montréal in August 1939. When she arrived at Liverpool on 11 September, she was converted into an armed cruiser, HMS Forfar. On 1 December 1940, 500 miles (800 km) off the west coast of Ireland, Forfar was torpedoed by U99. She sank the next day with 173 fatalities. Only 3 officers and 18 crew survived. Sources: Williams' Wartime Disasters at Sea; Bonsor's North Atlantic Seaway; Haws' Merchant Fleets.